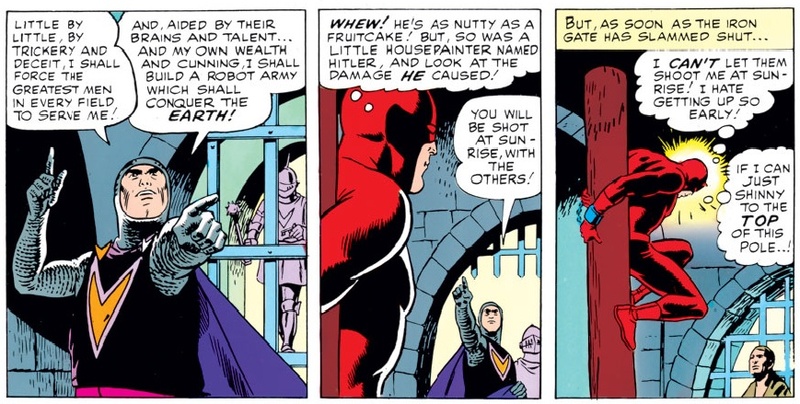 Rarely do I find myself actually laughing out loud when reading a Daredevil comic, and that includes most of the Silver Age goofiness. But Daredevil #9 really is that funny. And it knows it’s funny. 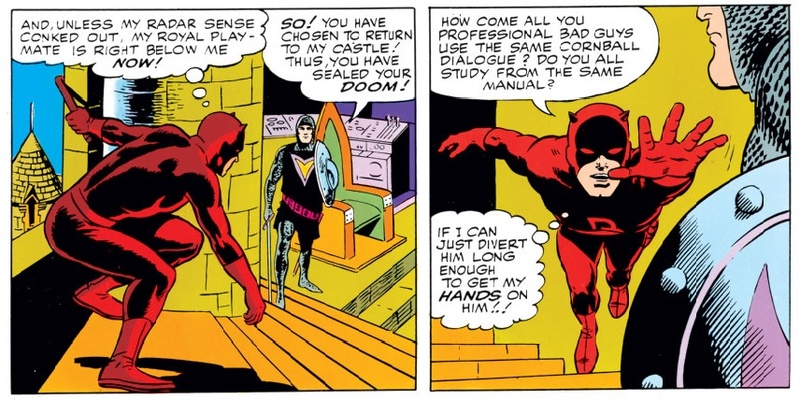 Daredevil himself is written in that self-aware way where he’s found commenting on some of the more absurd parts of the plot. This kind of tactic doesn’t always work, but it works fine here. It is more the absurdity of the plot than the villain’s failed plans at murder that that made me include it in this series, but it’s just so funny, I couldn’t resist. So, what do we need to know? Well, Matt has agreed to have eye surgery after Karen went behind his back(!) and contacted the appropriately named Dr. Van Eyck, a Boston eye surgeon who has recently moved to the “tiny principality” of Lichtenbad. Karen’s meddling goes even further and she sets up a meeting between Matt and his old law school acquaintance Klaus Kruger, former exchange student and current ruler of Lichtenbad, hoping that he can unite Matt and the famous Dr. Van Eyck. When Matt and Klaus meet in his office, we are treated to some interesting tidbits: 1) Why is Klaus Kruger twice the size of everybody else?, 2) Why was Klaus playing around with test tubes as a law student and 3) Why would Klaus seem surprised to hear that Matt had lost his sight when he was already blind by the time he started college? Then again, continuity gets confusing a full nine issues into a new series, doesn’t it? Matt gets suspicious when he asks Klaus why Dr. Van Eyck has decided to move to Lichtenbad. He is treated to a story about the good doctor coming for a visit and falling in love with the beautiful countryside, but Matt can tell it’s all a lie. And he’d be right. Why would someone move to Lichtenbad? Intrigued, Matt decides to tag along to get to the bottom of this. Matt doesn’t seem bothered by his impending doom: “He’s as nutty as a fruitcake, but so was a little housepainter named Hitler, and look at the damage he caused!” then “I can’t let them shoot me at sunrise! I hate getting up so early!” So, not a morning person are we, Matt? Or maybe it’s just the jetlag. This is where the evil duke should have just pulled out a gun and shot him. But, as we know, there’s always something. In this case, it’s bureaucracy. In true comic book style, a tussle ensues and Kruger plunges to his death after getting careless at high altitude. 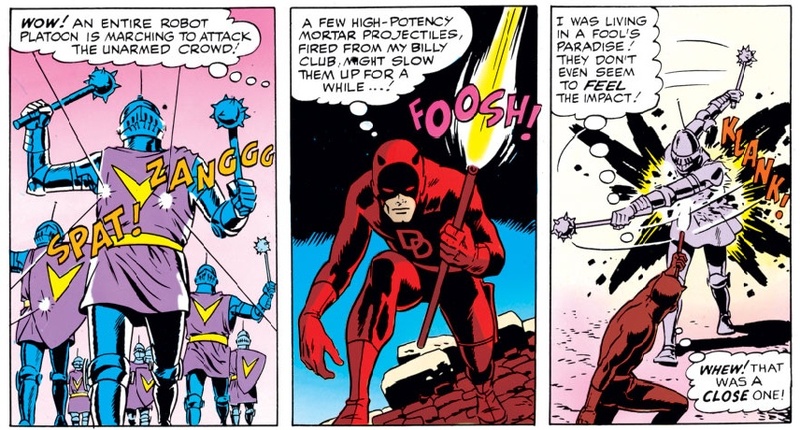 Daredevil emerges triumphant, but it is not he who gets to save the world. When Kruger decides to try to take the whole world with him with some nuclear-powered explosives, it is the timid eye doctor from Boston who saves the day and dismantles the bomb and dies of acute radiation poisoning. 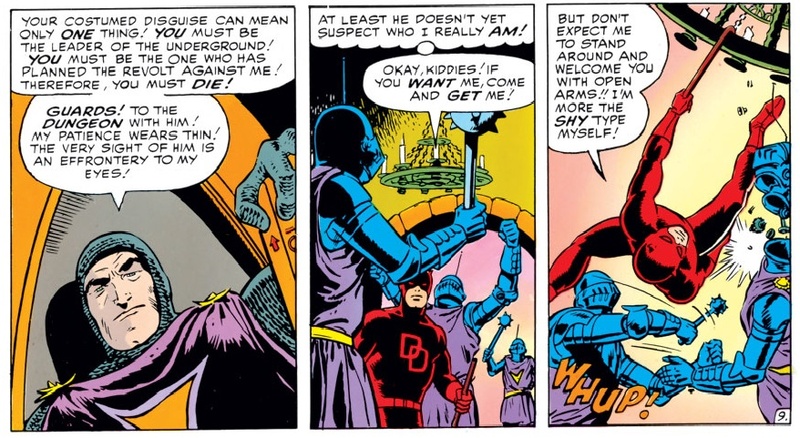 Though not before finding out that Daredevil and Matt Murdock are one and the same, simply by comparing their physiques. How come no one else ever thought of that? Matt goes back to New York, still blind, but having helped liberate an nation. This is one goofy story that needs to be read in full to be appreciated. I hope I was at least able to give you a small taste of this outrageous joyride. Hey Kruger Dr. Doom called; he wants his back-story back. 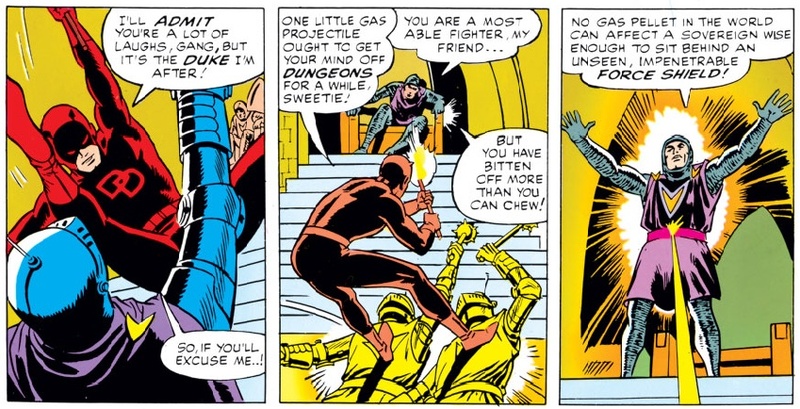 I wonder where Lichtenbad is in relation to Latveria in fake Europe. As far as the test tubes, Kruger, as an exchange student, needed to pick up some a core class or two that didn’t transfer (now there’s believable level of depth). Foggy was sure a slim young man back in the day. Point of trivia, Foggy wasn’t chubby until John Romita Sr. started his run (sorry, a little off topic). It’s a sweet villain who’s not only more powerful than a gas pellet, but any gas pellet in the world. That’s a lot of gas pellets. I think they should bring him back…oh and Stunt Master. Thoughts?